Peanut Butter S’mores Cookies – A dense, chewy peanut butter cookie topped with a large marshmallow and drizzled with melted chocolate. It’s a fun, new way to get your s’mores fix! Happy March, everyone! Spring is within reach. Can you feel it?! I was just in Texas for work and it was in the 80s. Insanity! Yesterday also marks the first day of lent, otherwise called Ash Wednesday. I’m not a super religious individual but I practice lent every year. I usually give up a food item, since food is my first love and, thus, is the hardest thing for me to give up. In the past, I’ve given up cheese, coffee, desserts, fried foods, and even gluten. This year I’m giving up another tough food group: chocolate. I’ve done it before and it’s a pretty rough 40 days. But fear not – I will still be sharing recipes with chocolate. I’ll allow myself to taste the food to make it sure it’s right before sharing with you guys. But that’s it! No sneaking bites after-the-fact. Alright, now. Enough sharing. Time for the cookie recipe for this month! In case you need reminding, with a new month, comes a new cookie. This month I’m sharing yet another cookie with peanut butter. 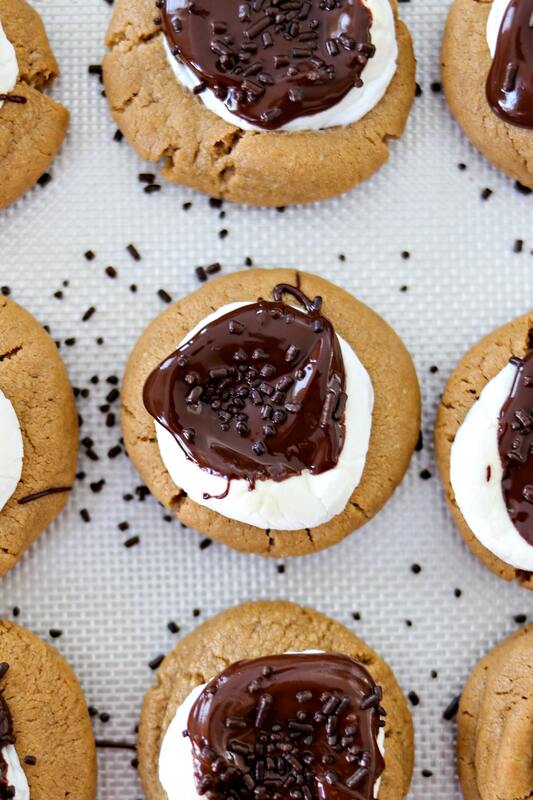 Meet the Peanut Butter S’mores Cookies! I made these cookies for the first time a few years ago. I was in a huge s’mores faze. It was serious. I would even make s’mores indoors by using a candle to roast the marshmallow. This is what addiction looks like. The best part about this cookie is that I could combine my new s’mores addiction with my life-long addiction to peanut butter and chocolate. How can that combo go wrong?! And on top of that, the cookie was super dense and chewy that it stuck to the roof of my mouth just like peanut butter does! These cookies are so simple to make. The dough is similar to the dough you make in a peanut butter blossom (those Hershey Kiss cookies). It’s super dense and doesn’t spread very much. But we still need to chill the dough a little bit so they don’t spread too much (30 mins – 1 hour). Once you’ve baked the cookies for a few minutes, you remove them, place a marshmallow half on top, and bake for a few more minutes to melt the marshmallow. Then you just top with a little melted chocolate and sprinkles, if you want them. I think they add a nice amount of texture/flair to the cookies so they look a little extra special. Peanut butter can get annoying to measure since it gets stuck in the measuring cups. To make it a little easier, I spray the measuring cup with non-stick spray and the peanut butter comes right out! Make sure you chill the dough a little so that the cookies won’t get too flat when they bake! To make sure the cookies are all the same size, I like to use a cookie scoop like this one. I use it for all my cookies. The uniform size makes sure they all cook evenly, too! Another tool I use for all my cookies is a silicone baking mat. It keeps the cookies from sticking to the pan and is sooooo much easier that cutting the perfect sheet of parchment paper. I almost never cut the right size so, when I can, I just use these mats instead. It’s a little tough to know when these cookies are done. I thought they were ready and then I tried to pick them up and they fell apart. So my tip for you is to check the edges of the cookies. If they look a little crisp and slightly golden, the cookies are ready. I used semi-sweet chocolate to spread on top of the marshmallows because I didn’t want the cookies too super sweet. But if you really want that authentic s’mores flavor, use your favorite milk chocolate bar! Now you know all you need to know. Go make these cookies! Let me know how you like them in the comments below. A dense, chewy peanut butter cookie topped with a large marshmallow and drizzled with melted chocolate. It's a fun, new way to get your s'mores fix! Add butter and sugars to the bowl of a stand mixer fitted with a paddle attachment. Cream on medium until light and fluffy, about 2 minutes. Add peanut butter and mix on medium until combined. Add egg and vanilla and mix on low until combined. Add baking soda and all the flour. Mix on low just until combined. Place dough in refrigerator for 1 hour. Preheat oven to 350 degrees. Prepare your baking sheets with parchment paper or silicone mats. Remove dough from refrigerator. Scoop about 1 1/2 tablespoons of dough and shape into a ball. Place dough balls on prepare baking sheets, about 2 inches apart. Bake for 8 minutes and remove from oven. Gently place marshmallow half on each cookie. Bake for 3 more minutes until edges of cookie turn golden brown. Remove cookies from oven. While cookies cool, melt chocolate in microwave for 30 seconds. If still not melted, microwave for another 15-30 seconds. Scoop a teaspoon of chocolate and spread over the top of each cookie. Sprinkle with sprinkles, if desired. If you want to store immediately, chill them in the refrigerator for 10 minutes to harden chocolate. These look sinfully fantastic. I just had SMORES in our fire tonight and wish I would have made these instead. Holy wow! Chocolate, that is a tough category- YOU GO GIRL! And, ummm…… YUM! PB cookie smores what a winning combo! Pinned this (and several more of your cookie recipes) so I can try them out. Oh WOW do these look good. I need to make them ASAP! yummy!! this looks sooo good! I am fairly confident we’d eat way too many of these at my house. These look so yummy and gooey. Love s’mores!! These cookies look divine!! I can’t wait to try them! Delicious looking cookies and great prep tips! Love that the dough is dense, so there’s not a lot of spreading during baking. It helps the cookies keep that lovely shape! Thanks for sharing! These look so yummy! I love smores anything and I can’t wait to give these a try! I’m drooling over here. I would love one of these yummy cookies! These sound and look like a great idea! I want to make these ASAP! Oh wow these are making me drool! This one sounds so yummy, and it looks fancy too! I’m not sure I could give up chocolate for 40 days… good on you for giving that a crack. I don’t eat it every day, but when I have a craving I just HAVE to have it! Peanut butter and chocolate go together perfectly. You got me on peanut butter. Anything with peanut butter and chocolate is my favorite. Oh my gosh, drool! You pretty much just combined all of my favorite things to make something magical! I love peanut butter and s’mores. I need to make these soon! These got pinned! They look amazing. I’m sure my family will love it when I make these. Ooooh I want to make these now! My husband would LOVE these!! So good!!! These look delicious! I’ll definitely try them out at some point in the near future. My husband would love these! I must try!! YUM! peanut butter smores cookies though next time. Oh boy, s’mores are my weakness. I just found out that Girl Scouts were selling new s’mores cookies this year but I didn’t realize that when I put my order in! Guess I just have to make these ones to get my fix in. I’m all about eating cookies these days. Trying to make different types. These Peanut Butter Smores Cookies sound very fun and easy to make. Should give them a try next time I am making cookies. Yesss! It’s a new cookie but with the classic flavors we all love.